Cold still coming-- Snow no chance. Maybe some light snow, rain or flurries Tuesday AM, but no real shot of anything more. Was totally wrong on the Thursday event-- won't do much of anything. Cold air still incoming-- a few days 32 degree range. Can't seem to break the cycle of Cold shot, cold air departs as storm approaches and then warm up for storm, back to colder temps. Need some blocking in the northern Atlantic to lock our cold air in. Cold is coming is a lock-- snow is POSSIBLE. Dusting off the weather blog to do some updates. December has been an active month with a few "winter type storms"..
Temps have been what I expected, slightly above normal. We are running a +3 on the month, but 2 days have bumped that up where the lows were in the MID 50's-60 ish rather than mid 30s or so. We'd be in my 1-2 range I thought if not. We should end up between 2-3+ for the month. It has been much more stormy than I had anticipated. We should be 3-4 inches above normal precipitation wise by months end with the rain coming tomorrow. More cold air is heading our way. 1. One model shows a round of snow Monday night into Tuesday AM-- this is ONLY the NAM and it usually stinks in this range. It be coating to a couple inches. There is some energy on the backside of a cold front that causes this. Not buying this-- but it's on the "watch" list. 2. Some VERY cold air comes in New Years Day-- highs in the 20's a couple days. 3. A stronger piece of energy comes in Jan 2-3. Models have been all over the place, but something called the ensembles have slowly agreed on a more southerly track that keeps the cold air in place (It's been an issue with no blocking to the north to hold our cold air in place. The air is VERY cold and as modeled now, it's not a super wet storm with modeled precipitation being near .5 to .6 of an inch. However, with it being very cold aloft, snow rations could be more like 15-1 so .5 could be 7-8 inches. Key issues will be how strong the upper air energy is and can we keep the cold air in place, but not TOO strong to suppress the storm to our south. Quick update: Ice wrap up, and maybe a little snow and sleet to end RAIN tomorrow. We dodged bullet-- had that morning sleet and ice been more intense, I think power outages would have been more common. Instead, things looked cool, pretty- whatever adjective you choose and life is pretty normal. I'm sure most of you saw footage from the Eagles-Lions game. Pretty incredible that they were expecting up to an inch via forecast, and they got slaughtered with 8 inches in the 95 corridor from Wilminton, DE to the Linc on Broadstreet. This is still an inexact science and mistakes will be made. Another wave passes through tomorrow. Should start as rain towards morning, could mix with a little sleet and end as a burst of snow. I think the snow idea is a bit far fetched, and you may see a few maps on FB bringing 1-2 or 2-4 inches down to our region. Overdone-- 64 north will be the region that gets the 2-4, maybe 3-6. Will keep you posted, but our best case scenario is 1-2 hours of wet, big flakes falling that MAYBE coat the ground. Late evening Update-- Potential to get much more serious. 1. Colder profile-- more sleet and snow. 2. Models have trended wetter-- mostly. Minimum is .50 falling, max is up over an inch. Most ominous is the RGEM-- Note this is in MM, and puts the 460 corridor in 25 mm, which is about an inch, give or take. Orange is right on top of 460. Will update on FB on twitter from here. PM w any specific questions. Snow and sleet develop north of 460 between 5 and 8 am tomorrow. Sleet, with maybe a few snow flakes, quickly changing to freezing rain develops southside Between 4am and 7AM. 460 north could see up to 2 inches of snow and sleet, mainly sleet. I suspect it's mostly freezing rain by mid afternoon, with a little sleet mixed in. For those wondering, sleet accumulates about a 3-1 ratio, so one inch of rain water 3 inches of sleet. I suspect that between .2 and .4 max falls as sleet. That's a half inch to about an inch and a quarter based on my best guess. Freezing Rain- southside will see a glaze to .25 at the most. Once you get NW Amherst County, Rockbridge, Fincastle north, .25 to maybe .60 could occur. The best moister wants to focus on that area JUST north of 460. Something to watch on radar tomorrow. Winter Storm Watches Hoisted-- Complicated forecast. As is often the case, with our storm as some details clear up others become more murky. It really seems like a mix of snow and sleet develops and begins a drift towards freezing rain, starting in areas to the SW and spreading north and northeast. Drier air is a concern and where exactly the best lift sets up is a concern as well, because some areas that are expecting a decent snow and ice event COULD end up rather dry, with just freezing drizzle the bulk of the day. Anywhere from 460 south needs to be aware of this concern. This will likely be a "winter storm warning" but will lack the total moisture to be a "big ticket event". The colder temps will make it a travel concern but major power outages, ect are not likely, especially from 460 south. North of there, snow and sleet should minimize ice build up. Yellow: Initial burst of sleet, maybe a little snow switching to Freezing Rain. up to a coating of sleet and snow, up to .15 ice build up. Green: Sleet and snow mix to start, Coating to 2 inches. Ice build up from .1 to .25 in hardest hit areas. Pink; Coating to 3 inches of snow/sleet. .15 to .40 ice build up. Yellow area includes: Martinsville, Danville and South Boston. Pink area includes: Northern Amherst, Northern Botetourt, Lexington, Staunton, Waynesboro. No real changes-- AGAIN. Don't mean to bore you. Let me "retract" my comments that sleet/snow chance have dropped. Model data has cooled and I think we can see a coating to 3 inches depending on location. Southside- Danville, Martinsville could start as a quick burst of sleet and snow. North and west, more sleet snow and ice- Lexington, Fincastle, Staunton areas. Key issue= from 460 south, including Roanoke and Lynchburg the once the sleet and snow flip to freezing rain some of the model data really slows down the precipitation. So, while it will be below freezing, we won't get a ton of ice in these areas. Southside is in the same boat, just less sleet and snow on the front side. Second wave? So-- we flip to freezing rain and then it slows down. Some data suggest we will have a second wave of heavier stuff late evening as temps creep towards freezing. Somewhere between late Sunday evening and Monday AM we should break freezing. Lynchburg Christmas parade is in jeopardy . Ridiculous arctic front comes through and the exact details are a bit mushy but we know it will precipitate and some layers of the atmosphere will be below freezing. The one change is my Coating to 3 inches may be generous for LYH and ROA, as it's trending more towards a more mostly if not all freezing rain event. 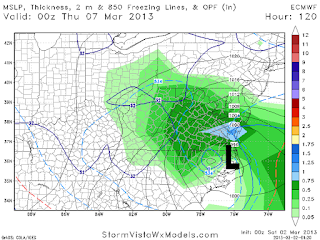 One model, the CMC or Canadian model is colder and has a longer period of sleet and a little snow. The rest are mostly freezing rain. The rest may and should have a burst of sleet. (Common when dry air is in place to moisten the atmosphere) and mostly freezing rain. I still think Lynchburg and Roanoke temps bottom out in the upper 20's and Danville to Richmond closer to 30 or maybe just 32. Total precipitation will be between .5 and an inch.. and if it is just a slow, steady freezing rain-- that's the best way to get ice build up. Look at this dry air at 700 mb Sunday AM on the NAM-- that's 40 dewpoint. This model extrapolated our would have a decent sleet burst. More updates on FB and twitter and full blog later. Brief update on pending ice event. So, don't expect a big snow-- at all. Will have a better update by tomorrow AM. Should get a nice bout of rain Friday and Saturday should be dry and cooler setting the stage. Temps COULD be at or slightly above freezing when it starts and quickly drop to the mid to upper 20's for a while Sunday. SOME data suggest a decent period of sleet mixing, while others are more beating the freezing rain drum. I still like my idea of coating to 3 inches of sleet and snow (especially north and west of Lynchburg)-- think more coating in LYNCHBURG, more as you hit Lexington and Staunton area.. then a decent ice event. If the model data comes in as I think it will, it should be our largest ice event in years. Sleet/snow-- that tends to coat the group and make ice build up easier on roads, etc. Possible wintry event next weekend..
Well, November ended up 3-4 degrees colder than normal and December is continued the trend of frequent bouts of COLD air. We should have a respite for a few days with some seasonable days early in the week and then a few MILD days with temps reaching the 60's later this week. All week an arctic front will be slowing moving east, reaching our area sometime late Friday to sometime Saturday. This air as modeled is VERY cold. We have a unique set up with a strong -EPO ( blocking up west of Alaska that is currently pushed north near the Arctic Circle, pushing COLD air to our side of the globe) So, despite other things we need-- +PNA, -AO and -NAO the cold air keeps heading to our area. As the front passes our region, it slows down thanks to the SE ridge. Flow aloft turns to the SW and we get what's called "over running". This will set the table for a possible major to significant snow and ice event. Hard to say EXACTLY at this point. 1. Strength of cold air both aloft (snow vs sleet and freezing rain) and surface (rain vs freezing rain) Cold air is often under modeled at the lowest levels in arctic outbreak, but sometimes overdone at the mid levels. 2. Where does the cold front slow down-- Southern VA, Southern NC. SC?? This would tell the difference between more snow and less ice. 3. How much moisture transports into our region? AKA--how much stuff falls out the sky. I'm fairly confident we see some type of an event next weekend. I'd guess a period of snow gives way to sleet and then eventually freezing rain. The big story will be figuring how much is sleet and how much is freezing rain. This won't be like that event last week with 3 day old stale and exiting cold air. This will be fresh cold air, maxing out during the event with MORE cold air pumping into the storm. Under this set up-- a typical event like this would be a Coating to maybe 2-3 inches of snow and sleet followed by some freezing rain with possible significant ice accumulation. We have a ton of factors in limbo that we don't know yet, but this is a "typical" outcome we'd see. More snow and sleet NW of Lynchburg and Roanoke, more freezing rain south and east of the area. Updates will be more frequent with this pending event. Lot's of Christmas events including my daughters FDA Christmas show next weekend AND the Lynchburg Christmas parade Sunday. The big story SHOULD end up being the COLD November rain over a 36 hour period. Rain totals should be 1.5 to as much as 4 inches. Considering it's been dry, the rain is needed but is coming on worst travel week of the year. Had we had blocking in the North Atlantic-- we'd be staring down a MAJOR snow and ice event-- instead the big story will be a Cold November Rain..
"It's hard to hold a candle, in a cold November Rain"
Did you know that Axl Rose started writing November Rain while in Jr High? 1. The storm should start as maybe a burst of sleet and then some freezing rain. Currently, the western regions of our area are under an advisory for the freezing rain, but it's predicted most areas for SOME ice. Cold air can be stubborn and despite that freezing rain without a cold air source is a self defeating process. (Freezing water actually releases heat, which sounds counter intuitive) And some pretty warm air will be riding over the top, (Surface temps will hold in the mid 30's but at 3-5k feet temps will approach 50)-- sometimes that last 200 feet are STUBBORN to warm up. So, while a trace to slight coating of ice is likely, we need to monitor for a longer period of ice tomorrow morning. Would not be surprised if most of the area ends up under an Advisory. Chance of ice over .10 tomorrow. Back Bookend: Ending as Snow-- If I had a dollar for every time a storm was supposed to end as snow...they are RARE. However, this is a unique set up where we have a strong arctic front coming as the storm ends with some strung out vorticity riding along the front. Looking at the soundings, (vertical view of our atmosphere with temps and moisture) I think we do get a quick burst of snow. Most places will have 1-2 hours of gloppy snow flakes falling that melt on contact. I could see a line of snow developing that "coats" cars, trees--grass but it won't be a HUGE deal. WPC has our region under a 30-50% chance of seeing an inch-- depending on where you are located. The Mts to our west obviously do better. The Big Story will be "Cold November Rain"
Social media chatter has continued about the big storm and possible snow. Looks like the rain will start early Tuesday for most of the Lynchburg and Roanoke areas and it will POUR. 2-4 inches of RAIN very likely region wide. Red are is OVER 3 inches. 1. As it starts, cooler dried air will be in place with temps near freezing. A quick burst of sleet could transition to some freezing rain for a couple hours Tuesday AM. My take-- these lows with trailing upper lows are tricky and fickle-- would not be shocking if NO flurries fell and would not be shocked if 1-2 inches of snow on the backside. Let's play conservative as of now and go with NO accumulations, but ending as snow. Mountain areas will do a little better. For those in social media world, there's been quite a bit of chatter about a possible SNOW event just before Thanksgiving. A series of cold shots will be heading back into our area, the first on late Saturday and Sunday will be FRIGID. Temps most areas will struggle to get above freezing Sunday. Because we have no blocking (-NAO) the cold slides out to our east quickly just as another shot approaches from the west. It won't be WARM, but not the bitter cold air we will have Sunday. More cold air is zooming in from the west as an upper air low literally moves across the country. Timing is key to when the cold air gets here and how much interaction takes places between the two jetstreams. 1. Out to sea with little rain. 4. Storm is a bit slower and snow threat increases. I'd lean somewhere between options 2-3 where we get a nice rainmaker before the cold that COULD end as a flurries or snow showers, with an outside shot of a coating to an inch. Areas to our west in the Mountains should have their first snow of the winter and ski season will get a nice early season boost with the snowfall and NICE chances to make snow. Will also be a challenge to get my +2-3 in December with the first 10 days likely to have a decently low of maybe -3 to -5 for those days. With the Holiday week coming up, I will update more frequently as this storm and cold unfolds. As of now, a decent rain event seems likely with .5 to maybe 1.25 inches of rain falling that could end as snow in the Lynchburg and Roanoke areas. I feel obligated to post...Snow threat? Many of you may have heard a little chatter from various outlets about a storm literally 7-8 days away. Speculation is good, if it's presented as speculation. However, what I fear is blogging has turned into Black Friday shopping where people get earlier and earlier alerts and the public can't gauge the difference between an actual threat a couple days out and just some fun chatter about crazy model outputs. What are the models showing? The models are showing some VERY unseasonably cold air moving in out of Canada. At the literally perfect time, a short wave digs in and creates a storm. Now, some model data shows a "Alberta Clipper" type event and other blow it up via "closing off" the upper air low and there is a HUGE event. Some of the data has "fringed" our area with the blow up and others have made it a huge event. The obligatory snow map from the most extreme run..
6-12 inches in our area, with a lot more just north and east. What do you think will happen?? This falls under the banner of-- just keep watching. What we know is this: 1. Some colder air is heading in our region for a visit and likely a short wave. My guess is that the cold air won't be as cold as progged and short wave will be much weaker and well north. Hence, the upslope areas well north and west of our area could get a decent upslope snow and some lower lying areas in WELL NORTH of our area could see their first flakes of the year. Even if the STRONGER colder air and upper air low cuts of, it is well favored that any extreme event (which I've stated is unlikely) would happen WELL to our north. I could give you the blah blah of why I don't update, but let's be honest-- I'm a winter weather guy. Yes, I talk Hurricanes and Severe on FB when it happens but my intense forecasting is about winter. So, if you are NOT a winter fan, you will like my update. 5 inches or under of snowfall. Mountain areas see more, but still well below normal. Not much data I see supports lasting cold or great storm patterns. I like to see how Eurasian snow cover trends in October as the final piece and that did NOT look good. Negative PDO - leads to trough on West Coast and Ridging in the east. Storm track well to our west, and when the pattern "relaxes" more east is still into the Ohio Valley reforming off the Delmarva. If I'm wrong-- there are ways to get stronger discharges of cold air into the east (-EPO) at times. I'm hedging it won't be. Also, you CAN get a fluke snow storm-- but I'm hedging against that too. Wow, if that storm didn't meet or exceed your expectations you can't place things in proper context. And, it will be all melted by noon tomorrow. March 25-26 1971 was the last time Lynchburg had a spring storm of that size. The official total of 6.5 inches is a little under the 7.3 from 1971, but when we beat a record that is older than ME (turning 40 soon) you need to be impressed. 1. Jan 17 deformation zone forms a bit south compared to modeled and much of Amherst, Bedford and a small sliver of Lynchburg got next to nothing. Sean Sublette in Midtown had 2 inches while Timberlake road had a good 3.5 to 4.5 inches. I put that down as 3.5 but could justify a 4 or even 4.5 honestly. 2. Mid Feb event-- inverted trough that dumps up to 8 inches over parts of Campbell, Appomattox, Charlotte, Buckingham and even into Nelson County. Tricky, tricky event. I drove down Timberlake and it was Covered with snow from the 460 back entrance near 7/11 and snow free past Lowes. I believe Sean Sublette reported .8 from his house in that neck of the woods. 3. March 5-6- marginal warm temps, early change to snow-- not much backlash. 3-3.5 inches. Didn't feel like that much. So, this event-- with a bad track record, going more than 1-3 seemed unwise. If you follow me on twitter and FB, I did say 3-5 early afternoon. The overnight went as I expected with 1.5 or so at my place. Fun event and you may not see this type event, this late in the season for a LONG LONG time. Seasonal outlooks are rough because it's part skills, part luck and part luck?? So, I'd say it wasn't my finest outlook (09-10 has that honor) but wasn't bad. Horrible on December, I'd grade it an F.
Better in January- I said +2 and it was +4.3. January was also very went between 2-3 bigger storms. Snowfall-- Climo is 18, range of 13-18 and we have that. 2-4 months were drier than normal- I touched on that. Temps were warmer than I thought, especially early in the winter. I had banked on colder air and it never showed up-- until march. I want to give myself a B-, but objectively it's more like a C/C- Getting a snow total close due to a late season 7 inch is more luck than skill. I believe this event was mentioned on my last blog March 17th. Great pattern, strong short wave-- end of March?? As I stated, had this been a January pattern and not the end of March, it of been one for the record books. March 5-6 is a 10-20 inch event, a couple smaller ones and this one on the horizon. If it were January 24th, I'd be deciding between forecast 3-6 and maybe 8-12. But, we are stuck. I've considering blogging but being honest-- the models have STUNK this year and it's made it hard. They keep upgrading these things and before you can work out the kinks for your specific region in interpretation, (especially winter with the temp issues of snow vs rain vs sleet) and just a LACK of events has made it a challenge. So, model data is all over the place. Some models have been showing pretty snowy solutions and others have been showing SOME snow, but daylight, lighter precipt etc makes me infer it won't accumulate. I'm still a snow lover at heart and part of my NON blogs was just not wanting to invest in ANOTHER event that will disappoint me. I mean, Jan 25th clipper with an inch was fun, but I expected an inch. 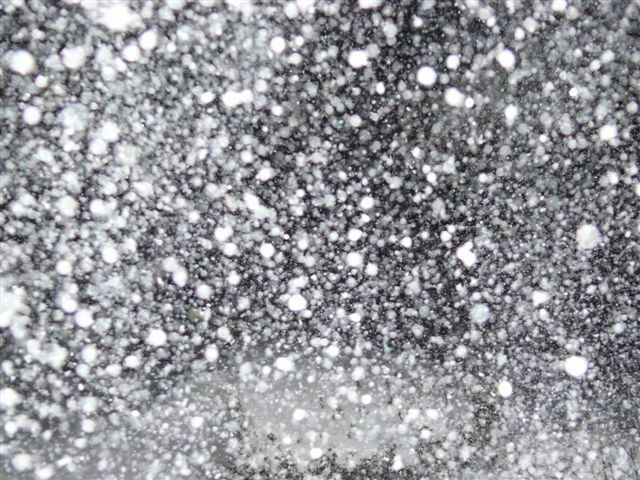 Jan 17th rain to snow was fun-- 3-5 inches of heavy stuff and 2 hours of the biggest flakes I've seen in LYH was awesome. Everything else has been a let down. We can see 6 inches. If everything goes wrong, we get a burst of sleet and snow that doesn't lay-- and then occasional flurries and snow showers that don't accumulate. As a forecaster-- I feel obligated to share both sides and then make an official call. As of now-- Roanoke and Lynchburg 1-3, with a little sleet likely as the events start. The biggest part is over by 8 PM tomorrow if not sooner and we just have lingering flurries and snow showers. NRV into the Highlands 2-5-- mostly snow. Better snow in the favored up slope areas. Will hit Facebook and twitter harder from this point. Everything else will be really now casting. . The LATEST Euro and NAM have a pretty decent burst of snow tomorrow mid day through dinner time. *GGEM* as well-- canadian model. If your a snow walk or like taking snow pictures, would be an excellent time. BTW, no complaining over late March snows. They literally melt the same day. Literally, I would expect most to melt overnight Sunday, event if we get 3-4 inches. This is the winter that didn't really want to get started, and now really doesn't want to end. It's not usually fair to say "What if this were"-- but we've had some pretty strong blocking most of March. Had this taken place 2 months ago-- we'd of had a heck of a winter. The March 5-6 storm likely would have been all snow, and 10-as much as 20 inches region wide. Even with the warm March sun pushing Tuesday March 5 up to 50, it started as sleet in Roanoke with dry and and even the rain here, the first 10 minutes or so had some "slush" in the drops as the dry air didn't allow for total melting. Southside is mainly safe-- rain. NRV would likely see less than LYH and ROA. Some freezing drizzle is possible after the main batch moves out and we have some linger moisture in the early and mid morning. March isn't over-- and neither is our shots at snow, yet. Data has been hinting around March 25 another "big" coastal low. I know March 5-6 failed due to the lack of fresh cold air-- this storm "may" have it. That's a LONG ways away and subject to much change. NO major changes- 1-81 special, north of Lexington! Last nights model data went with no surprises..
EURO moved towards the GFS. 2-4 inches LYH and ROA, more just north. Parts of Amherst may see close to 10 inches. We get a TON of rain before hand. FWIW, Short term model NAM is a tad warm, we don't get much accumulation from that one. This morning I hinted that the 6-14 forecasted by the NWS for Lynchburg was likely too high and they've adjusted everyone region wide down, with highest amounts of 6-10 for Amherst and Rockbridge county. 1. My statement of the ULL needing to touch NE South Carolina is huge-- and this won't happen. HUGE snow option pretty much off the table Lynchburg. Track now is MAYBE just north of 1-40 in North Carolina. If this had very strong cold air, we could deal with this, but in March with no parent high is a no go. 2. The trend has been more rain and less snow. This was obvious before the 6-14 call this AM from the NWS, but it was "watch" not "warning". My guesses have been a bit high as well. One issue is assuming a trend stops. As this as trending more north and warmer, assuming 36 hours this is done is foolish. So, my current thoughts of 2-5 may be high. 3. I need to follow my own rules of things ALWAYS trend north. This was NOT a confluence instance (Like Feb 19th last year) that kept it south, but vort interactions. That's a different breed. Some of the data now makes this a full blow Noreaster that runs up the east coast bring big snows along or maybe just west of of I-95. 4. The 18z GFS showed another way to get close to 6 inches in Lynchburg. The low takes the further north route and we do get decent rains. However, it REALLY cranks up around SE VA and sends warm air WELL to the North of the low. this pushes the snow bands well to the west and even south west where the decent, accumulating snows make it back to close to 460 in our region, especially east of Roanoke. So, with that-- my current thoughts which I will update later tonight or early tomorrow. Anything above 2 inches would shock me. NRV- gets a little crazy with elevation. maybe 2-4 inches. ** Edited to say-- you can see how precarious this is** I can totally see Amherst getting 10 inches in the city and by the time you hit Fosters Fuel on 29 it's 2 inches. I'm impressed with the National Weather Service from Roanoke- they just went BIG! And, they may go down in flames. :( My confidence is not that high. It's a battle of the models. 1.GFS, NAM, and SREFS: The crank up the low a JUST smidge north and east and we get mainly rain as the incredible snow bands sit somewhere closer to Charlottesville. 2,GGEM, Euro and UKMET are more south with the low and keep a heavy band, especially over northern and eastern areas much of Wednesday. 4dvar is an upgraded model and has tested to be superior in the big picture, but has lost some individual events so to speak. The NAM and GFS has both showed the big event at times, but the overall trends have been a NEAR miss. The Euro has been consistent and just varied a little the strength. What is the differences on a functional level? The biggest differences is how quickly this storm "winds up" and exactly where. The 4DVAR models are convinced it will be more to the south and west and hang that thing back longer to get us under a good snow band for hours. There are a ton of players this system. What do you think, Keith? However, at this time I would have liked to see the 3DVAR group move towards the 4DVAR group. They flirt, but don't commit. Some of the models literally every 5 miles you head North east out of Lynchburg ads an inch to your total. Amherst Appomattox- 6-10 maybe more in the higher elevations. If the banding sets up a tad south, these could be higher, especially Lynchburg region. Per the norm, will update this later-- not a lock at all. When banding sets up, it gets crazy-- like trying to guess exactly where a thunderstorm will form. The devil is in the details. Models that are weaker on the block over New England are further north, while those that are stronger are more south. It keeps the energy suppressed to the south. I felt great after the 12z runs until the 18z GFS which was more north. The other models are a tad north as well, but the EC is about the same for our region and bit south overall. It has about 2 inches of liquid that falls mainly as snow. Here's the blocking map I made earlier-- the block and 500mb low (vort) if as modeled on the EC will keep this storm in a great position for us. Any changes to your thoughts?? 1. Despite the EC and UK met staying south, the north trend concerns me. The blocking is strong--a few mets who I REALLY respect and trust are harping how strong the block is. If the block over Canada is as strong as modeled on the ECMWF, we should get a major snow event. 2. It's a lock we get SOME snow. Maybe 2 inches, maybe 12. I'll break down the chances later. 3. Banding will exist-- some winners and some losers. We've had too many events WAYY to high on total precip on the models. 4. Temps- BARELY cold enough in the Lynchburg to Roanoke area. Danville seee's a TON of rain before snow. We won't get the usual 10-11 -1 ratios. It will be more like 7-8 to 1. As we get close, we will massage these numbers. Just wanted to post a quick map before the evening data. Each model run brings us closer to a REAL solution. A big event is happening as the main shortwave is getting closer and closer and should be sampled better. Most of the data was good if like big snows. 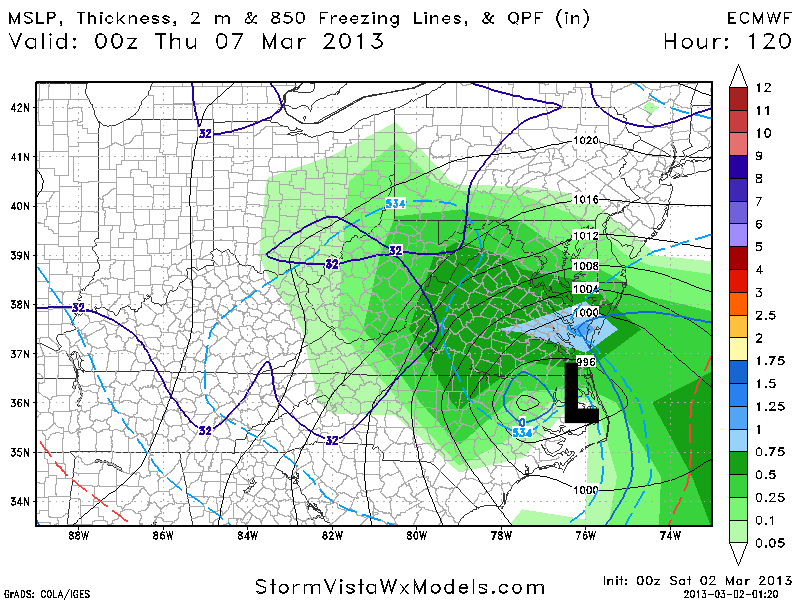 However, the 18z GFS took the more north track and was a TON of rain ending as some snow. More like 2-6 inches rather than the BIG event I want. So, this was done ghetto style on one note. 1. I drew two red lines-- One goes down into SC and NE towards Hampton Roads. the second line goes across Kentucky, along the VA NC line and near Hampton roads. These are the two presented tracks for the upper air low. For Lynchburg and Roanoke to get a big snow, we REALLY need the southern track. 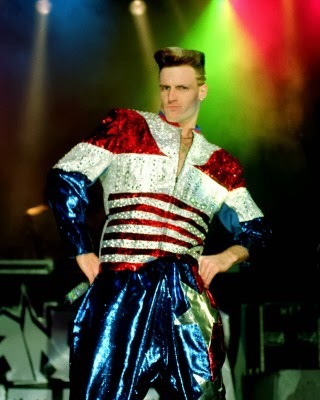 If it touches down in South Carolina, we are golden. If it takes that more northern track we will mix with rain for a while and it gets more complicated. While I liked the 12z runs and think it's plausible, as stated-- the north trend ALWAYS scares me. Well, most of the evening model data was promising if you are a snow lover. I tried to stay awake for the ECMWF or Euro and nodded off around 60 hours. Waking up and seeing it was UNREAL. The Euro was a madhouse-- with literally 15-25 inches of snow from Roanoke to Lynchburg with maybe close to 30 inches in places NW of Richmond. Don't take this literal-- at all, yet. Potential has certainly grown and we could be staring down a potentially historic weather event. We've moved away from a full phase event where two vort maxes merge near our region and more towards just a strong closed upper air low being pushed south of our region and slowing down due to the stronger blocking. The low gets vertically stacked which means the surface low and upper air low are on top of each other and it's a beautiful event. Here's a link to an article about the Ash Wednesday storm. This guy was up towards Massanutten, but it conveys how intense that storm was. This storm, 51 years later, would fall on Ash Wednesday. Lynchburg had almost 18 inches of snow from this event that stalled off the VA coast for day and was one of the costliest storms ever in terms of coastal beach erosion. We are still 100 hours away. There will be changes in the final solutions.. Here's a quick guide to ways to sabotage our winter event. 1. Temp profiles are not horrible, but March with sun and no cold air advecting. In our region of the state, with a late afternoon Tuesday start, it may start as rain. Models are tad warm at the surface and this is always a concern. Taken literal, the EURO has rain in Danville for HOURS after it's snow in Lynchburg and Roanoke. Models TEND to be a bit cold at this time frame in general. So, we could get the BIG event, but too much rain that limits it. Once we get under the "deformation zone" we should get plenty cold-- but deformation = banding. I've mentioned before how banding can be hit or miss. This could start and end as rain-- once the storm occludes, it quits making cold air. 2. The upper air low doesn't dig as much. This would cause both temperature issues AND less precipitation. From my experience, you want the upper air low to travel about along 1-40 in North Carolina to max things out here. This is a very strong low and moves from North Central South Carolina NE towards let's say Kill Devils Hill on the Outer Banks. That's an incredible track. Until we hit the 72 hour mark, I'm not sure this willing to bet on a track like that. If it slides NORTH,we are warmer and a less hours under the "heavy" bands. This issue comes in if it DOESN'T dig down into South Carolina- what if it's only North East Tennessee. This can't be ruled out yet. 3. It doesn't slow as much-- Very possible. Spring is notorious for slow moving upper air lows-- and I'd love to see it but this looks extreme on the EC. A faster solution could yield a nice event, let's say 6-12 inches, but not historic. 4. Snow ratio's are horrible. On the January 17th event this year. Near my place on Timberlake rd, we had close to 4 inches from about .7 liquid. So, it was close to a 5-1 ration. Normal ratio is 10-1 or so. Between warmer temps, slower spells that could mix with rain, even if we get the 2.5 liquid as modeled. Ratio's could be as low as 6-1. That would be 14-15 inches of the heaviest concrete snow you'd ever seen in your life. 4. Over 18 inches of snow 5%. I'd love to show the vorticity maps I get from a vendor, but I'm not willing to risk that. However, here is a qpf map from another site I found on FB. It shows one of the 6 hour snap shots of how much precipitation falls in 6 hours. MOST of VA has at least .5, places in the east exceed an inch. The model has 2 time frames like this plus another not far off. Social Media has made weather forecasting next to impossible. Just about everyone has an idea some of the data shows a potential big snow next week. Someone posts a map, people take it as gospel and chaos ensues. 1. Pattern is ripe for a big storm, but has some flaws and issues. 2. We have decently cold air aloft, but the lack of High Pressure to our north to push in LOW LEVEL cold is an issue. 3. Model data spread is from suppressed in South Carolina to blowing up late and missing our region, but bringing a good event from DC north. 4. Timing is everything-- the exact strength of the blocking to our northeast and timing of the shortwaves will determine this event. 33% chance we see an accumulating snow. From that, 10% shot it's over 6 inches and 3% shot it's over a foot. Key issue is how hard it snows. If we get 12-18 hours of light to moderate snow, we could get ..50 of liquid that only accumulates a slushy inch and is basically melted before the last flurry ends. If there were any trends last night, it was for a later phase which leaves us drier as the storm is disorganized before this point. The key shortwave will be coming ashore later tonight over Western Canada-- that will help. I think by mid day tomorrow we should have a general idea of if this is a legit threat. The HPC HAD an area of liquid in our region of between .5 and .75. After the model data last night they shifted that east and we are in a .25 to .5 for the period. Not that this is gospel, but it was a step back for our region and a step forward for places to our north and east. Here, we've got a storm dying over the Midwest and some moisture pushing on the east side of this low SMACK DAB into very dry air. Dry air, that often just dries this stuff up. Next, we have second wave coming through late Friday into Saturday and cold air, just cold enough lingering around. 1. Don't fret temps-- this air is colder and drier than Monday's fiasco. Temps are near 40, but they will drop a degree or two and before precip starts and then tumble quickly down to near freezing, bottoming out in the upper 20's. 2. I'm still not sure where this is going. Short term models have the heavier stuff going to our south-- closer to the NC/VA border with even maybe a quick 2-3 inches before it changes. The GFS/ECMWF (Euro) are much drier and maybe give us .15 or so before noon tomorrow that starts as snow and ends as freezing drizzle. The NAM which is ALWAYS too wet-- has almost 2 inches of snow in our region. I think that snow and sleet breaks out after midnight west and between 2-4 east. It may mix with sleet at first, kick to all snow and then transition back to sleet and then eventually freezing rain. Most schools and stuff cancelled tomorrow. Snow through mid morning and sleet through 1 PM or so-- sooner the more South and West you go. BTW, Blacksburg is on Facebook and here is their snow map.. I think their map is a bit cluttered, but conveys the general idea. You should follow them. Another storm system will pass WELL to our west and with it bring a chance of sleet and freezing rain late tomorrow night and Friday AM. This is a limited moisture event and should only provide a minor glaze if it all materializes. Most of model data does bring in the moisture but a few are VERY light in the order of a couple tenths of an inch. In most cases their will be an initial burst of sleet that is quickly over to light freezing rain. Temps look to get near Freezing by mid morning Friday. The temps will hoover just above freezing all day and may dip below freezing for a time as another slug of moisture comes through late Friday night into Saturday morning. IF this is just a tad cooler than anticipated, it could be a more substantial ice event. I'm thinking we JUST miss it but some areas to the north and west of Lynchburg and Roanoke, above 2000 ft may get a good glaze out of this. We are in a stormier, wetter pattern through the first 10 days of March. Early next week, we may be looking at another event that starts as snow and or ice and ends as rain and then the first 10 days of March may have a shot at a Nor Easter or two-- with some colder temps CLOSE. A storm is passing WELL to our west in the upper Great Plains. With that, a warmer push of air is going to create some precipitation in our region and we should get a burst of snow and sleet towards daybreak. NWS has an advisory for west of the Blue Ridge-- lower regions expect 1-2 inches of snow and sleet and higher 1-3 with both places at risk for a glaze of ice. Southside may avoid most of the snow and ice. Pretty intense local event-- the NAM was on to something with a stronger band, but it was more NORTH SOUTH vs SE to NW. Also, because of the limited scope of a model-- it was a more defined pause of either IN our OUT of the band.. no real tapering. Places in Appomattox had up to 8 inches. 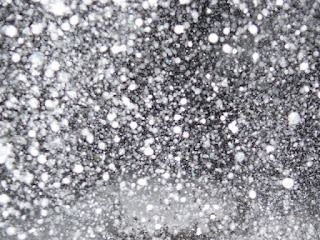 A friend reported close to 4 inches in Eastern Campbell county but said a 5 minute drive towards LYH went to NO snow. On the way home from the moster truck show there was NO snow until I got off on 460 BUSINESS west-- by the 7/11 and then the ground was covered. Once I passed Lowes on Timberlake, there was NO snow again. Strong storm-- just the upper air energy had not consolidated before it passed our region. It has become a MAJOR storm over the Northern Atlantic Ocean. Could be a snowy day in parts of our area?? Round two is getting fired up. NAM- Has a strong band that pushes up from the SE to the NW somewhere between lets say Altavista and Amherst. In that band, a few inches fall. Outside of it, coating to an inch. The NAM is a short term model-- may have an edge here. GFS- has a general 1-2 inch snowfall from lets say LYH and DAN east. Super short term models RAP and HRRR. These update hourly. RAP- really over emphasizes that big band and dumps up to 5 inches for those under it. Outside it, coating to an inch.Shows it much closer to LYH in the same general area. HRRR- Has a heavier area, but it's further east-- does NOT really get the greater LYH area. Will use Twitter and FB to update from here but I'm taking my boys to the Monster Truck show this afternoon, so I'll be cut off for a while. :) If it starts to snow good, flip on radar-- that may be your best bet. This winter has been interesting with many events but all of them VERY small. Fragile house of cards on tap that could collapse either way. Guess what-- he comes ANOTHER or two. Today will be very mild as we have a cold front approaching, SW winds in front put us WELL into the 50's this afternoon. Temps will cool off quickly and a little impulse along the wave will induce some light rain that could end as a light snow. At best, we COULD see a coating out of this overnight. From the odds makers- Tonight. From there, a second piece of energy rotates through tomorrow and forms a low pressure NEAR the Outer Banks. This system is interesting in that the models are trying to developed some type of inverted trough. If this happens, we could see this but a coating or even a couple inches is possible. This will be a have or have nots where some places see 2-3 inches and others get nothing. Odds for Saturday- which at this time FAVOR eastern regions. I'll update FB and twitter later today with ideas. If you want a coating, tomorrow looks much better. Well, If you felt neglected during the recent bouts of small snow, sleet and cold-- my apologies. Sometimes it's hard to blog when we MAY get a half inch. Those parade of clippers did about what I expected here and that storm Thursday night wasn't a big deal in our region BUT Roanoke was the crush zone with 3-4 inches in the city and reports up to 5-6 just outside the city. I would not of been shocked with an inch or two but the end results were incredible. Our Weather- 2 chances of snow in the next 8-9 days. 1. Valentines day- some of the models have pushed a storm towards us. With minimal cold air in place, I like this storm better for Harrisonburg north. The Euro is not on the storm yet, so by no means is this a lock. 2. Presidents Day weekend. Some data has signaled a shot at a larger storm. It's been harder to get a larger winter type storm with winter so I'm not locking this in, but the potential exists. This is a better set up then valentines day. If you watched any of the storm coverage last night-- an incredible band of snow crashed ashore over long island and CT. Reports of 7 inches plus in an hour. I've taken pics before in 3 inches an hour. The light makes it look different and it was NOTHING close to this. NWS has upgrade the entire region to a Freezing Rain Advisory. not a very WET system as total precipitation will be maybe .10 to .15, but colder ground temps and surface temps in the upper 20's and low 30's will make for some NASTY road conditions through mid to late morning. National Weather Service issued a winter weather advisories for all the counties along and east of the Blue Ridge. The freezing will be light-- maybe .10 total falls out the sky but with the colder temps as of late and LIGHT stuff falling it has the makings for a disaster in the am. Half the issue is that folks may not see the ice on their driveway, get on the road and there is just a few slick spots here and there. There was an event in December of 2007 where there was .02 precipitation and the road were just a disaster. Side note-- If I were king of the world, We'd of had advisories everywhere Friday BEFORE 10 am. It was a situation with the cold temps, even an inch would make a traffic issue-- and that's clearly what we had Friday. Be safe tomorrow morning. By 10 am, we look to be all good again. Expect school delays. This has not been a fun event. Cold temps, dry air and models all over the place. And, being all over the place varies snow from 1-3 inches. It's not a huge storm and never really had high side potential. However, I take time and put my best effort into these forecast. The air is very cold and dry, the upper air support is meager and weak and the energy is transferring to a coastal low that will scoot away from the coast. It's a losing process all around. I've made minor changes to my ideas. 2-5 NRV, MT Empire and those areas. I think sleet pushes in down south towards Danville, Martinsville and South Boston eventually. 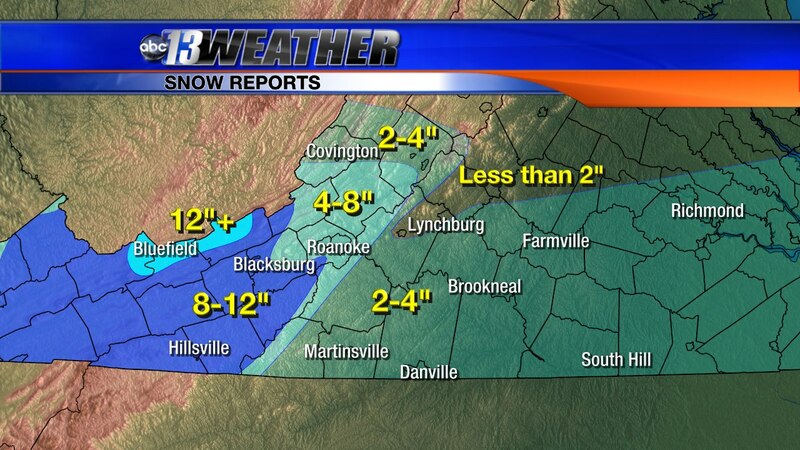 Roanoke gets around 2 in the city proper and east towards LYH is about an inch region wide. However, some of the high resolution models are picking up on a decent band of snow forming near the NRV and pushing east just along and south of 460. So, Roanoke and Lynchburg in this path. If THIS happens, a quick 2-3 inches is possible in those regions. Will update early AM if needed, but just know that MOST areas east of Roanoke are in the ONE inch side of things. Be safe, even if it's a dusting. Colder temps, way down near 10-15 tonight will make the roads rough quickly. It's my experience that either extreme slush list last week during the HEAVY snow or lighter snow with cold temps makes for the worst driving. The cold has arrived and we are sitting at a chilly 14 degrees this AM. If we can get through today in Lynchburg below freezing, we may not touch freezing until the weekend. A fast moving clipper system comes through tonight and could drop a few flurries. Some places- especially north of Covington to Amherst line may see a quick coating. Not a big deal. The problem arises in the fact that this system is a bit close to our Friday system and drives our reinforcing cold air a little further south AND inhibits our storm Friday and may decrease our potential snow. The "magical" ECMWF- which did decent in our area on last weeks storm but was WAY to far north with the model showing snow into DC when it didn't really make it north of Charlottsville shows a nice 2-4 storm east of the Blue Ridge with maybe up to 5-6 west. The rest of the model data is showing as little as a coating with maybe up to an inch or two. As of now, I'm splitting the difference and going 1-3 East of the Blue Ridge and 2-4 west, south of Staunton. We should have a better handle on this later tonight and into Thursday. The cold will continue into early next week before a brief break. Cold week on tap, maybe some snow LATE week. The cold is coming. It's not horrible, bitter arctic- but it will be a break from our really mild winter. Highs in the mid to upper 20's and lows in the teens. We are being spared with the cold push not driving down deeper than the mid south, we are not getting in the core of the cold. Still, bundle up, watch your pets if they are outdoor and get that firewood inside! Don't rule out flurries at certain times either tonight with the cold front or Wednesday with a clipper going to our north. And yes, Granma's cabin in the Mt's will get a little more. I'm watching a system for sometime in the Friday time frame. Models are all over the place with the furthest track south passing right over us to the most north going about the Mason Dixon line or so. If it tracks at us-- we get a quick hit of snow that ends as ice. If it tracks near the Mason Dixon- We get a quick hit of ice that MAY end as rain. Will update later as needed. Our storm came off as expected with NOT a bad forecast, but certainly a glaring snow hole from parts of Bedford county into Amherst as the "mega band" formed just a smidge south and missed some areas. From WSET-- Total snow estimates. This type of system, this can be expected. I tried to state several times that when the band forms, that there will be winners and losers. The model data was clear there would be a transition of the band as it progessed east and the data was off by maybe 25 miles on the formation. For those who got under it, it was pretty incredible. I knew something was up when people in Bedford and Amherst were telling me it wasn't snowing yet and I was getting clocked. This is a snip from the airport weather station. I assume the change over was the same time. We had snow mixing around 4:45 and it was mostly snow by 5. With that assumption, .70 liquid fell as snow. Between the warm ground, marginal air temps, etc it was 3-4 inches for those who were under the heart of the band. That's a 5-1 ratio. A normal snow has just above 10-1 ratio. Incredible flake size-- flakes of 2.5 inches across and maybe even 1/8 of an inch think. As a guy who tracks and chases snow, I don't know if I've ever seen flakes that big. The snow had huge divots like a golf ball as it accumulated. My assumption was we'd get 7-8 to 1 ratio on the snow fall. Had that verified we would of have 5 inches or so. Further, as the band moved south there were a couple lighting strikes, one near Concord and the other down towards Altavista. So, I'd grade my outlook a B or so. Those big bands are hard to forecast and getting the ratio wrong as well makes less than perfect. I think the overall flavor was pretty good. Nothing big on the horizon. We will have few pretty cold days next week but nothing extra ordinary. All overnight data looks as good, if not better. I was tempted to upgrade west regions to 8-12 and east to 4-8. but going to resist as of now. Just know that literally anywhere the extreme banding sets up has potential for more than forecast. Brief map. West of green line is 6-10 with the best banding places getting 12. East is 3-6 with local spots up to 8. I highlighted a couple spots that I think can get those higher amounts. West of the Blue Ridge-- SW side of NRV down towards Hillsville and the Mt. Empire. East of the Blue Ridge-- Northeast of Lynchburg EARLY may catch some good banding as the set up and then later in the evening Danville, Martinsville and South Boston may catch the better rates longer. Final Call to "grade me" on. As the stronger lift moves in, there could be a couple hours of mix of snow and sleet in heavier burst, but eventually it will be snow and heavy stuff. If we flip sooner, watch out. NRV, MT Empire - North up, bending east to north of Amherst -81 between noon and 2. Danville-Martinsville- South Boston 4 and 7 PM. Strong possibility of Thunder. Best hour rates may be 2-3 inches for 2-3 hours. Possible tree damage due to wet ground and heavy wet snow. No blogs likely, FB and tweets. Quick update-- is this legit? This has the potential to be a very fun and memorable event. Doubt we set any snowfall records, (Maybe daily, need to check) but 7 inches falling in 4 hours would be good fun. However, tough system to track and as I've stated- even if it plays out on as depicted on the best models for snow, there will be winners and losers based on where the banding sets up. So, 3-6 outlook may see YOUR backyard get 2 but many others get 6-7. It won't be a uniform snow total. Banding isn't really modeled well- so that's another forecasting concern. Also, most places start as rain-- and it won't be that cold. So, some folks will start whining about the weatherman blowing another. I'd recommend following Sean Sublette and Jamey Singleton on FB and Twitter for other resources for current trends on the weather. If it were up to me, I'd of gone warning region wide. 2-4, while very plausible is on the low end. As of now, All the counties WEST of the Blue Ridge are 4-8 and east are 2-4. Further, there are Winter Storm Warnings to our West and North, and watches to our south and east. To single out 4-5 counties East of the Blue Ridge is confusing and with the fast onset and potential for more, it's my belief it was the more prudent choice. With that, if we all get a couple inches east of the Blue Ridge, they'll look great. This is being driven by that upper air low I graphed yesterday. The exact strength, track and speed play a huge role. If it ends up a tad weaker and faster-- we won't see as much. If it's a bit stronger and slower-- we could see a foot. The point being, while I am optimistic about this event there are more factors that we can't control in forecasting. So, if you want snow-- hope that ULL goes a little slower and stays closed (stronger) as long as possible. I'll do a full update later this evening with an actual map. Busy day tomorrow trying to work before the snow starts, but I'll tweet and FB all day as needed. I don't foresee any major changes in my 3-6 east and 6-10 west because I'd rather massage up if needed than forecast a foot and have the average be 2 inches. Just keep in mind that "potential" is certainly there. FB- Keith Huffman-- Subscribe or friend me as I use hootsuite to update FB and twitter at the same time. Some of the snowier models kick the ROA and LYH areas to snow early afternoon. Be ready for bad travel, school closings and a general mess. The exact speed and strength of that "closed upper air low" is a huge factor. Winter Storm watches in effect EVERYWHERE west of the Blue Ridge. My hunch is if the model data holds serve, they expand it region wide. There are off hour runs of the GFS and NAM, both are still the crazy snow changover- but timed a bit different. 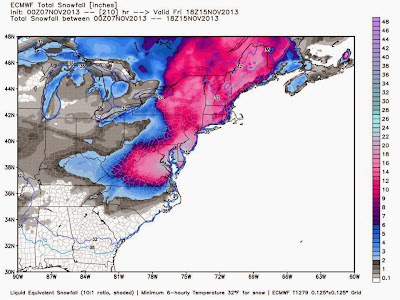 GFS is over to snow much faster-- but the event is faster. NAM waits a while, but last longer. In the end, results are about the same. If you want a "first guess"
Areas west of the Blue Ridge-- 5-10, high elevations may see 12. East of the Blue Ridge- 3-6, local spots up to 8. Going to be some issues-- change over will happen quickly in the NRV and Highlands- and then slide east. If you are out when it changes, roads will get bad QUICKLY. If nothing changes on the model data, it will be ROUGH travelling. Further, While the NAM radar looks impressive, these band have a life of their own, You may see and inch or two and your brother 40 miles away sees 8. Yellow is what you often see under thunderstorms-- and once you get under the yellow, it's likely snow. First shot is at 7 PM tomorrow and second is 10 PM. Mega band just ROLLS our region. Per this model- 7 PM-- just getting crushed NRV ROA up and down 81. And three hours later it rolls through the rest of the area. Snow rates 1-3 inches in that band for 3-5 hours. To Bat out of hell .. If the Euro jumps on board, you will hear BIG time honking Wednesday AM about snow Thursday. Will update this when ECMWF comes out. Lost in the inches of rain has been a slow, meandering upper air low coming out the southwest. Traditional thought is outside of 3 days, hard to get 2 separate systems back to back that close. So, a few model runs here and there have been showing the second just sneaking in a bring a rain to snow even and they've been dismissed. As we've moved closer, the southern ULL has held together and is modeled stronger. The temps are initially too warm, but the ULL cools the atmosphere and shows the system going from HEAVY rain to HEAVY snow. Often, if model data shows a cold front pushing in and a switch from rain to snow, they struggle. However, getting a vortmax in the right spot is a GREAT way to get that rapid shift. Until-- the model data mid and late afternoon shifted more towards a possible snow event and so far ALL the models have come on board with rain developing Thursday and then changing to snow-- and then DUMPING snow for 3-5 hours. In that 3-5 hours a GOOD snowfall could happen in the lines of maybe 3-10 inches. These are tricky events, and with the type of banding some places may only get 1-2 inches and other 8-9. The cool thing is because of the ULL, MUCH of VA, down to even the coast CAN cash in on some snow. Here is the 500 mb low-- these are often shown by mets on TV-- these are the upper air energy that help form and enhance storms. 500 MB low, goes negative. (tilts NW to SE, common in stronger storms)--heads off the NC coast, perfect for VA snows. When it was NEVER frozen?? Next week is going to be NICE-- VERY nice. This weekend will be seasonable and very nice. Next week will heat up to have some days well into the 60's. However, a term we used quite a bit last year called a "sudden stratospheric warming" is about under way. What this does is breaks down the polar vortex and pushes the cold away from the north pole. This will be underway over the weekend. Lag time before impact is 10-14 days. So, pattern change begins Jan 15th or so but should take another 5 days or so to adjust to our region. Hard to say looking 2 weeks out, however if we want decent snow if this pattern comes to fruition this may be our best shot at a wintry couple weeks. The cold air seems to start in the plans and mid west and then build east. Tough call, because the last cold snap was more west based and built east. This seems to have a better set up with what is called "cross polar flow" meaning the air is coming from the coldest regions rather then last time where it wasn't SUPER cold. Well, the SSW is a lock. The only issue we can see with these is the cold goes to the wrong side of the globe. It happened last year. However, the arctic oscillation hit -3 in December and it seems to be heading that way again. (stats show that is likely). That should being some cold air to our side of the globe. Next issue is getting the fully into the east coast region-- which should happen, but not till after January 20th. I will update late this weekend.